Afternoon classes are a very good thing when school ends at noon, as it will today. I came home yesterday and lounged in front of the fire for an hour before starting dinner. I can feel my mind emptying of all that's it's been trying to hold in place for the past few weeks. This morning I wandered around the house with my camera, snapping bits and pieces of Christmas decor. It's such a pretty time of year. The paper cutting above was done by my eldest daughter more than 15 years ago. I store it in a box that's just the right size. This ornament arrived in the mail before the tree was up, so I hung it on the soup tureen ladle. It hasn't moved. It might stay there for this season. On the piano is the old International tractor, a hand-me-down from friends at least 25 years ago. It's weighty. Made of metal. Tim made the little trailer for it. Did you notice the little lights? I'm so tickled with them. They are tiny wires with built-in LEDs. Battery-powered. So delicate. I noticed Tim playing with them - he's the one who arranged the lights on the paper trees. There we are, the three of us. I'm on the right, the bossy big sister. I'm guessing I was 5 in this photo. 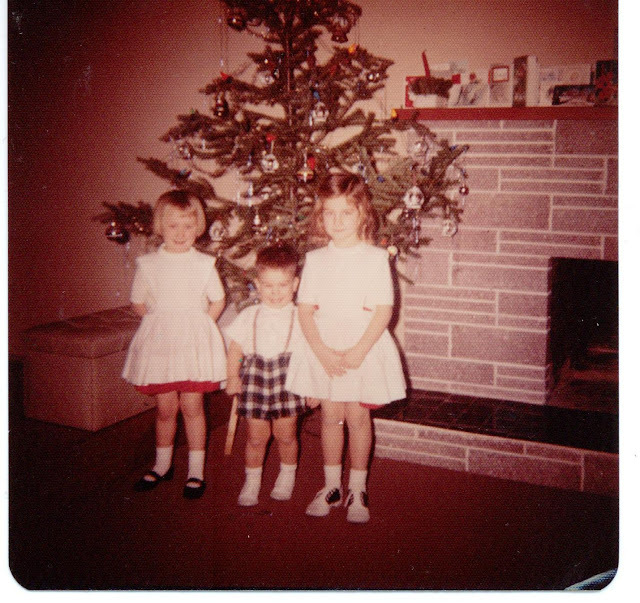 My mother always sewed beautiful Christmas dresses for my sister and me. These were red skirts, blouses and white pinafore aprons. I remember the aprons. Memories. From my windowsill. A wish. Unlikely to be fulfilled. We've had just one white Christmas in the 14 Christmases spent here. Time to finish my tea and then think about what to do with my day. I am going into school to input a few grades and enjoy lunch with my colleagues. Then....? We'll see. Linking with Five on Friday, hosted by Amy. A great five, beautiful décor. Loved the paper cutting by your daughter and how it is still in pristine condition, amazing. I have the little battery lights also, they are so easy to use...but rarely last beyond one season. They look like little fairy lights...so lovely, especially for the paper trees. I knew which little one was you immediately... Your youngest granddaughter favors you! We are not expecting snow either. I am trying to remain appropriately sad in front of those in my corner who are wishing for snow. In reality, I am delighted. I purchased some of those tiny lights for a fairy garden but haven't used them yet - next year! It's nice to wander around looking at decorations and have memories flood back from them. Enjoy the quiet of the next few days. I have enjoyed my little peek around your home this afternoon. Such a pretty time of the year, isn't it, when one can add special touches like an embroidered heart on a soup tureen ladle? And those tiny strands of lights...also special. Thank you for sharing these glimpses. Oh...and I love the photo of you and your siblings in your Christmas finery! So sweet! That's a lovely feeling to be able to in wind & empty the mind & just enjoy the week ahead! I love the paper cut out by your daughter & the little tree too with the lights! Have a great Chriatmas week! The photo of little you is darling! My mom made Christmas dresses, too. I love those red skirts and aprons! Your decor is lovely, Lorrie! According to my brother, I'm also a "bossy big sister". HA! Alas, he lives too far away (4-hour flight from us) now for me to boss him around. We had some flurries today, but it looks like we're going to have a green Christmas here too. Your daughter did an amazing job on the paper cut piece. Beautiful! All your decorations are just lovely. Oh my market has those lights and I have been debating about them. I think I must buy some, especially because they are marking them down. Such a lovely home - everything is just perfect for the holidays. The embroidered heart is so sweet - gives me an idea for next year. I am loving those little lights too! I'm using them in many places this season and for my daughters' wedding, in the centerpieces. Enjoy the season, savor it all. We'll not have a white Christmas this year, either. So fun to peek in on some of your decor and memories associated with them. I like those tiny lights and will keep an eye out for them. I'm also wishing for a white Christmas. It's sounding hopeful. Beautiful ornaments, old and new. The lovely old photo made also me remember past Christmases and dresses made by my mother. It's always a joy to visit your blog. I wish you and your loved ones a very merry Christmas and a happy new year! We just got our first snow here in PA / under an inch but pretty to wake up to. Beautiful glimpses of your Christmas decor. I love the paper cut out your daughter made. I bought 2 sets of those tiny LED lights this year and love them. One set blinks. School is over here for the next 2 weeks. I wish you a relaxed holiday. Ha! Priceless photo of you and your siblings. Lots of nice things to remember when you see your decorations. All so pretty, and glad you are getting a break and a rest. Those teeny lights are so pretty. Such sweet decor but even sweeter memories. I love the picture of you as a wee one. Sending warm winter wishes for a Merry Christmas to you. I'd say I'll send some snow...but I doubt it would stick...Merry Christmas. Things are looking very pretty and festive over there, Lorrie. I think the paper cutting your daughter made is so beautiful. A very special gift. Your little lights are so sweet. I think I saw a package of them, but didn't realize what they would look like lit up. If I see them again, they might need to come home with me. The LED lights and the paper tree are just charming! Your house looks so lovely, and I enjoyed sharing a childhood Christmas memory with you as well. You home looks bright and cosy . Your home looks warm and welcoming with good Christmas cheer. Will you be returning the classroom after the first of the year? I am done. Retired yet again. I will do my tutoring on Fridays--no planning, no grading. Just the fun part of teaching. No money either. Ha. I don't know if we will have a white Christmas or not, meaning new snow. We have snow on the ground now and it might just be gone by the end of the week. Or mostly. I do wish you and your family a Merry Christmas. What pretty Christmas snippets in your home, Lorrie! I love the paper cutting your daughter did so long ago. And I had a mother like yours who sewed beautiful dresses for me and my 3 sisters. I can see through reading some of the above comments that it brought back memories to many of us. Good stuff! I love this post, Lorrie!! Your Christmas decorations are beautiful, and I found it relaxing to look at these images. Lovely! We got some of those battery-powered, LED lights this year, too; we're using them on our mantel. Love them!! The paper cutting your daughter did is gorgeous. It reminds me very much of the German hand crafts that we see in our 18th-century community of Old Salem. The felt heart-shaped ornament looks so Scandinavian, and it's charming. We would like to see a white Christmas here, too, but they're calling for temps. here in the high 60's to low 70's. So silly. Thanks so much for your visits and kind comments. I've fallen behind in my visiting due to family illness, but am trying to catch up. :) Have a joyous week, Lorrie.